ST. PAUL, Minn. — Rep. Ilhan Omar came under a fresh round of criticism Friday for remarks about Israel that critics decried as anti-Semitic. Speaking Wednesday night at a forum at a Washington, D.C., bookstore with fellow freshman Rep. Rashida Tlaib of Michigan, the Minnesota Democrat said she fears everything they say about Israel is construed as anti-Semitic because they're Muslim. She said that prevents a "broader debate" about Israel's treatment of Palestinians. Omar and Tlaib won their seats in November, becoming the first Muslim women elected to Congress. The comments, which Omar made when the questions turned to her previous criticism of the American Israel Public Affairs Committee, were first reported by the website Jewish Insider. Some Jewish leaders said she then revived an old trope about divided loyalties among Jewish-Americans when she said, "I want to talk about the political influence in this country that says it is OK for people to push for allegiance to a foreign country." She added, "I want to ask, 'Why is it OK for me to talk about the influence of the [National Rifle Association], or fossil fuel industries or Big Pharma, and not talk about a powerful lobbying group that is influencing policy?'" Steve Hunegs, executive director of the Jewish Community Relations Council of Minnesota and the Dakotas, said in a statement that he was appalled by her suggestion that Jewish-Americans have divided loyalties between the U.S. and Israel. He said her comment "continues the unacceptable pattern of the Congresswoman deploying anti-Semitic rhetoric when speaking about Jewish-Americans' involvement in our nation's democratic process." 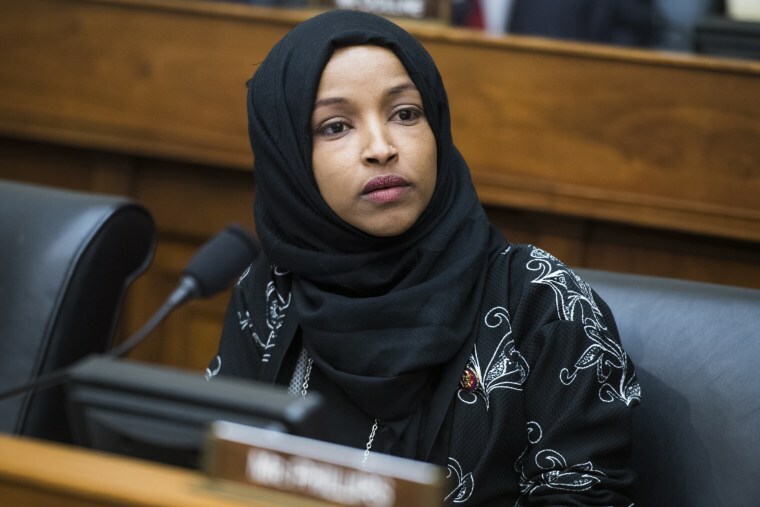 Omar ignited a bipartisan uproar in Washington and at home in Minnesota last month when she suggested on Twitter that members of Congress support Israel for money. Many Jewish leaders denounced her remarks as reviving old stereotypes about Jews, money and power. She soon apologized and said, "Anti-Semitism is real and I am grateful for Jewish allies and colleagues who are educating me on the painful history of anti-Semitic tropes." Many progressive Jews rushed to her defense, however, saying it's not inherently anti-Semitic to criticize Israeli government policies or AIPAC. Omar's spokesman, Jerermy Slevin, said Friday that Omar reiterated at Wednesday's event "the remorse she feels for her comments last month — and the pain she knows they caused. As she said in her apology, we must distinguish between criticism of a particular faith and fair critiques of lobbying groups." He added that she has "consistently spoken out about the undue influence of lobbying groups for foreign interests of all kinds." Hunegs said he met with Omar last week and found her new comments "particularly insulting" because he had showed her a photo of the grave of his cousin who died in France fighting for the U.S. in World War II to "illustrate the proud patriotism" of Jewish-Americans. "Our community is exasperated by Rep. Omar's unfulfilled promises to listen and learn from Jewish constituents while seemingly simultaneously finding another opportunity to make an anti-Semitic remark and insult our community," Hunegs said. AIPAC tweeted about her latest remarks, "The charge of dual loyalty not only raises the ominous specter of classic anti-Semitism, but it is also deeply insulting to the millions upon millions of patriotic Americans, Jewish and non-Jewish, who stand by our democratic ally, Israel."